In Boiled Over Julia Snowden is preparing for the Founder's Day celebration when the worst thing possible turns up. A body under the wood in the fire. With that new employee Cabe Stone has disappeared, running away quickly. 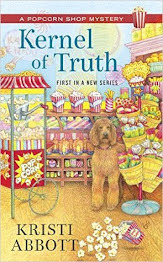 Julia believes in her heart that Cabe is innocent, but isn't sure why he's running. She is determined to find out what is going on and how Cabe plays to all this? 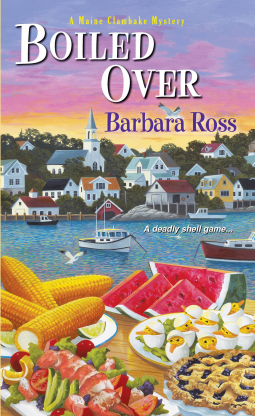 There was so much about this book I enjoyed the fact that it takes place in small town Maine on the water was a great treat for me. I love ocean side books something about small towns and oceans just draws me in. Also meeting all the people Julia interacts with was also fun. I also enjoyed watching Julia grow relationship wise realizing what she wants just hoping it's not to late with Chris the man whose taken her heart. As for the murder that seems to head in one direction which is Cabe the newcomer to the island. Where did Cabe come from? What is his story? Julia is determined to find out what his story is so she can help keep him out of jail. And the victim how many people wanted to snuff him out? Was it a previous enemy or someone new? It was fabulous with all the twists and turns this book had. 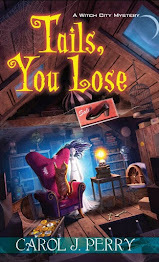 This one will definitely catch you and reel you in wanting to solve it as much as Julia does!